by all accounts cazorla is a hard worker and puts in a good defensive shift, and even played in a deep midfield position for malaga at times last season. Anyone know exactly where in the midfield he lined up for Spain please? I do wonder what chances Rosicky will get at all now this season as as of today, I can only see Cazorla used in the most advanced midfield position. I think he is wasted out wide. I've just the goal, dreadfull goalkeeping! Looks from the highlights as if we was playing centrally instead of the wings. Passing, ball retention and mobility all seem very impressive, id like to see him there as well. Arsenal manager Arsene Wenger has heaped praise on new signing Santi Cazorla after his performance in the 0-0 draw with Sunderland. The Spaniard made his Premier League debut on Saturday and put in a man of the match performance which will have delighted most Gooners up and down the country. Cazorla joined the club from Malaga for a fee believed to be in between £12-£15m and has already impressed fans and teammates alike with his displays in matches and in training. He seems like the Gunners natural replacement to former captain Cesc Fabregas, and looks as if he could be a real hit in the Premier League this season. His manager was just one of many who was full of nice things to say about the Euro 2012 winner. "He played very well and looks like he could be one of the buys of the season," said Wenger. "He has everything you want in the game. He can play short, he can play long, on the right or left, he can play the final ball and works hard as well. He is a fighter so it is very positive for us. "[He settled quickly and] that shows people who say you need to play a long time together. Great players do not need a long time [to settle]." As good as he was against Sunderland, it will be interesting to see just how good Cazorla is at rugby when Arsenal travel to the Britannia Stadium to face Stoke City in their next league game on Sunday. Jamie Redknapp on Cazorla: "You couldn't get the ball off him in a telephone booth. He﻿ is that good." And, he just seems to go about his business with no fuss. 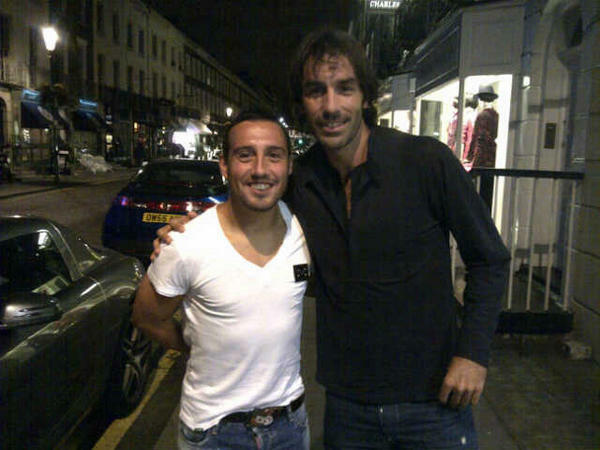 Robert Pires, they just dont make em like that anymore. PLAYER! When Santi Cazorla first heard about the interest from Arsenal this summer, he was flattered but wanted some advice about the wisdom of the move. His team mate at Villareal before he moved to Malaga was the one and only Robert Pires, so who better to call. “Robert told me not to think twice, that I’d enjoy it, that it’s the perfect club for me, that Arsenal has aspirations to win the title and go far. The Arsenal fans and players are very happy to have him here as well and have made the little Spaniard amazingly welcome. We have finally found the player who can fill the hole left by the departure of Cesc Fabregas to Barcelona. Cazorla does not want to be compared to Fabregas, however, because he feels they have very different styles and he wants to make his own mark. One player he does want to emulate is his international team mate David Silva. The two are similar in stature and playing styles, and Cazorla wants to add another similarity, silverware. Silva was another player who Cazorla contacted about his possible move to England. “I spoke with Silva before the move and he said I would enjoy everything about the Premier league. “He’s won the title with Manchester City and said I’d enjoy the football and the respect between the players, which is different to Spain. You can tell by his face when playing, that Cazorla loves being a Gunner and he has been fantastic ever since donning the shirt. He has great confidence that Arsenal are good enough to win things, although he is aware that there must be no slip ups today. Cazorla also told the Mirror that Arsene Wenger is like a father figure to the team and all the players have an enormous respect for him, and that the spirit at the club is similar to that in the national team of Spain. Let’s hope we can emulate their success too. Hahaha everyone should watch this. Really good. Quite surprised he was able to give Mertesacker a high five. It was a low five for Mert though. Why Arsenal are lucky to have Santi Cazorla, Spain's best kept secret. Where Real Madrid twice failed, Arsenal succeeded in capturing a player who already looks like the signing of the season. There's something about Santi Cazorla. He has a strange effect on people. Mention him and there it is: the wide eyes, the enthusiasm, the enjoyment, the sense of discovery, the fun. From Ruud van Nistelrooy escaping the sun at Málaga's training ground and offering a judgment of unsolicited simplicity, to Xavi Hernández citing him as the embodiment of a footballing manifesto that has conquered all, there is something about him that brings out the fan in footballers. And in football managers. "What a player Santi is," said Van Nistelrooy puffing out his cheeks early last season, just weeks after becoming his team-mate for the first time. Xavi, signalling his chest, said: "Have you seen Santi Cazorla? You think I'm small? He's up to here on me and he's brilliant." Neither man was asked to talk about Cazorla; both men, team-mates of his, chose to. As for Arsène Wenger, he called on every kid in the country to watch Cazorla play. And it was not just what he said that stood out as the way he said it. The look on his face. Every time Arsenal's manager has mentioned Cazorla since he signed from Málaga for €15m (£12m) there has been a childlike quality to his response. A giggling guilt: how did we get him? And for that price? A price that Málaga's coach, Manuel Pellegrini, this week called "an unthinkable gift". Málaga's financial crisis provides part of the answer; the passivity of other clubs, though, remains a mystery because, however much Cazorla is touted as an unknown revelation, he is nothing of the sort. The surprise is not that he is playing well – former team-mates say that they never had any doubts – but that, at 27, it has taken this long for him to be universally recognised. So far this season he has created more chances from open play than anyone else in England. It is not new: last season he created 82 goalscoring chances; only behind Lionel Messi, Mesut Ozil and Jesús Navas. The year before that, Opta put together a statistics-driven perfect XI of La Liga players: Cazorla and Juan Mata were the only non-Madrid or Barcelona players in it. "When we signed him last summer, he symbolised us crossing from a good team to a great one. He is a player who plays and makes others play, supremely gifted. An artist," says the former Málaga sporting director Antonio Fernández, whose job it was, fleetingly, to lead the first big money project in the country. Fifty caps for Spain – this Spain – say much, and Cazorla played a key role in winning Euro 2008, but he missed the 2010 World Cup through injury. The inevitable question runs: if he is so good, why did Madrid or Barcelona never sign him? The short answer is: they are Real Madrid and Barcelona. And Madrid tried. Twice. In 2008 Cazorla was caught by TV cameras talking on the phone to Iker Casillas about his imminent move to Madrid, but Villarreal moved to block the transfer. And this week Pellegrini, his coach at first Villarreal and then Málaga, told Gazetta dello Sport that he had tried to sign him for Madrid the following season. "He has the talent to play for either of those two but when the situation arose, Villarreal made an effort to keep him and he wanted to show his gratitude to them after all they had done," explains Carlos Marchena, a team-mate with Villarreal and Spain. "I could never understand why Madrid or Barcelona never signed him," says Marcelino García Toral, his coach at Recreativo de Huelva. "It is hard to explain and it also makes me a bit sad. I think it's a real pity for the Spanish league." Those who knew Cazorla knew. "Anyone who has played with him knew that everyone in England would fall in love with him," Marchena says. Joan Capdevila, Cazorla's room mate at Villarreal, adds: "He does things you've never seen. You want to know how good Santi is? Type 'Cazorla, Seitaridis' into YouTube." The video is almost six years old, from the time that Cazorla spent at Recreativo de Huelva aged 21 to 22, a single-season hiatus in his seven years at Villarreal. In it, he flicks the ball from one foot to the other and through the legs of the Greek defender. It happens so fast you have to watch it again to appreciate the skill. And the problem, Capdevila says, is that few even watched it the first time: "If he had done that in the Champions League it would have gone round the world." The technique is natural. Watch the Spanish national team do piggy-in-the-middle drills and you can see it. The ball whizzes round so fast, so precisely, that even very good players, world champions, can be made to look average. Cazorla is emphatically not one of them. Sit close and the speed can be dizzying. Cazorla barely flinches. Pass, pass, pass, right foot, left. "I played with him for five years and I still don't know if he is right footed or left footed, even from corners and free-kicks: it's insane," Capdevila says. Marcos López is a coach in Oviedo who remembers being struck by an eight-year-old playing five-a-side futbol sala for a team called Covadonga. A team of kids from the neighbourhood, they were in the same division as clubs with long histories like Astur, Sporting Gijon, Real Oviedo and Estadio, where Juan Mata would later play. Still they won their group. "By the end of the season they could easily have scored 300 and conceded 20," López says. "Santi was very, very small but he was dynamic, could dribble and controlled games. He left everyone open mouthed." Real Oviedo picked him up. Among his coaches was Luis Sánchez. "Santi stood out immediately, not least because he was tiny," he says. "These days everyone plays on Astroturf but back then all the pitches were muddy and he looked so small. But although there were inevitable question marks I never feared that size was going to be a problem. He could already kick a ball wonderfully with both feet, technically he was miles better than everyone else: he was prodigious. He could go past you on either side, and he was the top scorer by miles. He was dynamic, different. His talent is innate. And besides, he got stronger: he looks little now, but he is tough." From Oviedo, Cazorla joined Villarreal at 15. But it was the year at Recreativo that made him. "You could see even then that he had all the qualities to be world class," says Javi Guerrero, who played with Cazorla there. "He was absolutely clear about where he wanted to go and we knew he would get there. He was two footed, even taking corners from both sides and both feet, swinging in or swinging out. I remember being impressed by that but what was most striking was how daring he was for a player so young." The word Guerrero uses is desparpajo. It's a word many employ to describe Cazorla, one that could almost be translated as cheek. And watching the video Capdevila recommends, it is easy to see why. Yet there is also something eminently sensible and calm about his game. Listo, smart, is another recurring word. He controls the pace, the fluidity. In fact, Marcos Senna sees him as a potential long-term replacement for Xavi in the Spain team. Recreativo's manager Marcelino says: "I had first seen him as a kid playing in Asturias but I'd lost track of him. When Recre signed him, we quickly realised that he was special. He was extremely clever." "He reads the game so well," says Antonio Fernández. "His movement with and without the ball is exceptional and his always takes the right decision. He improves those around him, playing for them not just himself." "Santi is always available: he never, ever hides," says Capdevila. "He is a real leader. Not in the sense of shouting at people: he is not aggressive, he doesn't confront the referee, but he is a winner. He's extremely stubborn and very determined. Even off the pitch: even when we play cards or on the PlayStation, he always wants to win." Capdevila talks from experience: Cazorla jokes that the "one time" Capdevila beat him, he took a photo of the screen as proof to show his team-mates . "I have watched him closely on the pitch for a long time and one of the things I don't think people see is that capacity to suffer, to read the game and know how to adapt: when to be practical, when to be expansive," Marchena says. "He is also always there for you, in all games, injured or not. His commitment, for someone so talented, is extremely unusual. For weaker players, sure. But not for someone like him." "Players who think they have got it all tend to stagnate but Santi was never like that," Marcelino says. "He was straightforward, noble, very mature, humble. You didn't have to tell him much but when you did he listened and took it all on board. One of his greatest virtues was that he loves football. He watched every game, he was humble, he listened, and he wanted to win. He was a fútbolista futbolero." Guerrero explains that description: "He watched every game, read everything he could. He really lived the game." Friends recall him as a 10-year-old playing his own games before heading off to watch his brother play, a football always at his feet. "With Santi it was football, football, football," Luis Sánchez says. "He has changed a bit though. Back then he hardly talked. I still see him occasionally and now he is a joker." Cazorla's smile is part of his charm. "He tells the worst jokes ever," says Capdevila and Capdevila knows a thing about telling rubbish jokes. "His are worse – and he doesn't even know how to tell them properly. I laughed every single day with him." Marchena says: "He is a great team-mate, good in the dressing room: he never has a bad word for anyone, he is always smiling, always willing to help you out." To put that in sporting director terms, Málaga's Antonio Fernández says: "He creates an environment conducive to success." The text message response from one player responding to a request to talk about Cazorla sums it up: "For Santi, anything." When Cazorla left Villarreal, Senna said he felt like the team had cut off a finger. They had qualified for the Champions League in his last season; in their first without him, they went down. Senna explains: "When Santi left, it left a huge hole. Both on the pitch and off it. If he had been there I am sure we would not have gone down. He is a player who never loses the ball. He's so complete: he knows when to pause, when to accelerate; he imposed a style and dynamism on the team. He interprets the game so well. And without him, we lost our identity, our way of playing." Marchena agrees: "His departure was one of the main reasons that we struggled." While Villarreal went down, Cazorla's new club, Málaga qualified for the Champions League for the first time in their history. And, when financial crisis hit, he left them too. Wenger was ready to take advantage. The perfect player, perfectly suited to his new environment. Fernández says: "The other thing to take into account is that his style is perfect for Arsenal. He suits a team that wants to have the ball; he facilitates that approach." Senna says: "If it had been any other club, I am sure his adaptation would have taken longer but Arsenal play his way, similar to Spanish teams, so I am not remotely surprised that he has been so successful." Wenger's definition sums it up: it is not just about creativity but about control. "He opens defences with the quality of his passing and he gives us a technical security that allows us to escape when we are under pressure. He can make us stronger and more efficient," Wenger says. There is, Capdevila says, just one problem: the language. "I want to see his first interview in English. Now, that is going to be a video worth watching." At the small school on the outskirts of the village of Lugo de Llanera in northern Spain, there was recently some news which shocked pupils and teachers alike: football had been banned. The official reason was that the health-and-safety brigade thought too many children were getting hurt during their kick-abouts in the concrete playground that surrounds the Colegio Publico Lugo de Llanera. The real reason, no doubt, is that they have given up trying to produce another Santiago Cazorla. Cazorla was a football-loving short kid who always had a football tucked under his arm. Now he is Arsenal’s ball carrier too, a brilliant midfielder with enough talent to have dampened the despair at Robin van Persie’s departure and to give Arsene Wenger’s side hope ahead of their trip to Old Trafford on Saturday. Arsenal have lost their crown jewel, but they think they have found another gem who can give them an unlikely win against the team who beat them 8-2 last season. That short kid is now the 5ft 6in footballer who has quickly built a reputation for sublime control, the ability to pass and shoot with both feet and an eye for goal. He’s the quintessential skilful midfielder that reminds England of what they don’t have. Most of the village will watch the game against United in the bar which carries Cazorla's name. They adore him, still marvel at his ambidexterity and raise a glass of their beloved local cider with each goal he scores. Cider is at the heart of everything in Lugo de Llanera. It is the drink of the Asturias region in north-western Spain and is generally accompanied by no shortage of ham, chorizo, black pudding and white beans. They pour the cider from above their heads so it lands in the glass below at a pace and with fizz. Once poured, the glass doesn’t touch the table and the cider is downed in one big gulp. This is a routine Cazorla knows only too well and one he still enjoys when he comes back to the bar, which is run by his best friend Fran Ribero. ‘We have been best friends since we were nine,’ says Ribero, buzzing text messages to his London-based friend in between answers. ‘We preferred football to schoolwork. Our school used to win every tournament in the area because of him. He always had a ball under his arm — and I mean always. ‘It’s a quiet life here — although we’re Spanish so we like to party too. After Euro 2012, we had a huge surprise party for him with thousands of people. We shut off all the roads and the police had to come along. Cazorla’s family also go to the bar, which is a five-minute walk from the sports centre named after the Arsenal midfielder. His mother Loli and older brother Nando pass by while we are there, both immensely proud of Santi and both painting a picture of a determined, happy boy whose inner strength helped him overcome the death of his father from a heart attack almost six years ago. ‘He and Nando were just football, football, football,’ says Loli, a warm woman with a smile that gets bigger every time she mentions her son’s name. ‘We had a small house and my husband worked in the mines, then when they closed down he was a builder. Santi was a shy boy, they both were and they played football all day long, even in the house. She laughs and puts her head in her hands when the topic of school arises. ‘He didn’t like anything. Maybe PE. All the teachers used to say to me that he was a lovely boy but he just wasn’t interested in working. So they told me, “Take away what he enjoys — don’t let him watch TV”. Nando, himself once a very talented player, remembers the same boy. Nando was a striker who some argued had more talent than his brother but who all agree did not have the same drive to succeed. Young Santi had no such problems, first taking part in training with his brother’s group because there was no team for seven-year-olds and then moving to the indoor five-a-side teams that children up to 10 years old compete in. It’s only when they are 13 that they play on a full-sized pitch for the first time, so the ability to keep control of the ball in tight situations comes as no surprise. With his incredible ability to use both feet equally well, Cazorla excelled, scoring 170 goals in one season and soon catching the eye of Real Oviedo, one of Spain’s big clubs. By then he was good friends with Roberto Toral, then an Oviedo team-mate, now a journeyman in the Spanish lower leagues. ‘We played together for six years at Oviedo,’ said Toral. ‘We had some tests to see whether we were going to grow or not and Santi and I were told we were always going to be small. So we ended up always hanging out together, becoming really good friends. We still are now. ‘But there were money problems at Oviedo when they were relegated from the first division so they had to get rid of players. Villarreal wanted Santi so they let him go because the manager Antonio Rivas didn’t think he was going to play much. He probably feels a bit stupid now but he didn’t think he was tall enough. He wanted big strong players. ‘Santi’s mentality is perfect — you don’t see him angry, he doesn’t fall out with other players. No-one has a bad word to say about him. That’s so important. Cazorla soon found someone for whom he was tall enough, his long-term girlfriend Ursula. They have a two-year-old son, Enzo. One huge sadness in the family is that Cazorla’s father Jose Manuel never met Enzo, the 48-year-old dying of a heart attack in 2007. They are happier times now, with Cazorla thriving in the Premier League with two goals and three assists so far for his new club. Fifty caps for Spain and successful spells at Villarreal, Recreativo and Malaga show you he is valued highly back home during a vintage period for Spanish midfielders. ‘He’s so happy in England,’ says Loli with another smile. ‘The people at the club are nice and he’s only worried about learning English. 'He was worried he wouldn’t be able to chat to people so he’s busy learning. But he has Mikel Arteta to help him for now. I spoke to him after the Norwich defeat and he was so upset. I told him not to worry, that even Barcelona have bad games, but he was inconsolable. He has always been like that. ‘But I know Santi will definitely come back here to live one day. He loves it here. He’s very patriotic. He can live normally here. Get it right at Old Trafford and there will be many more.